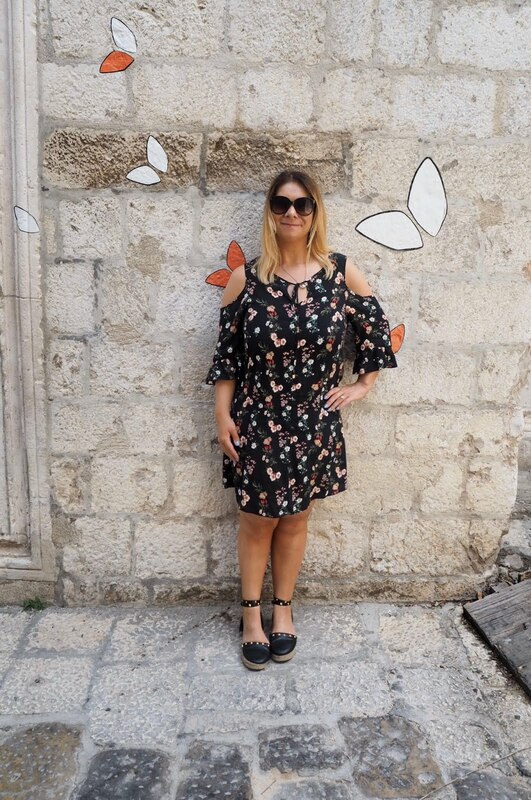 One of the things I love most about blogging is the opportunities it presents to try new things. Things, in fact, that I may not ordinarily do. From camping with GO Outdoors to paddle-boarding, kayaking & climbing 24km terrain in the Lake District with WMGT, it’s fair to say I’ve stepped outside my usual comfort zone since my blogging journey began! Whilst it goes without saying, I love nothing more than chilling in the garden with Adam and the bunnies, sometimes it’s good to do something different, something exciting! 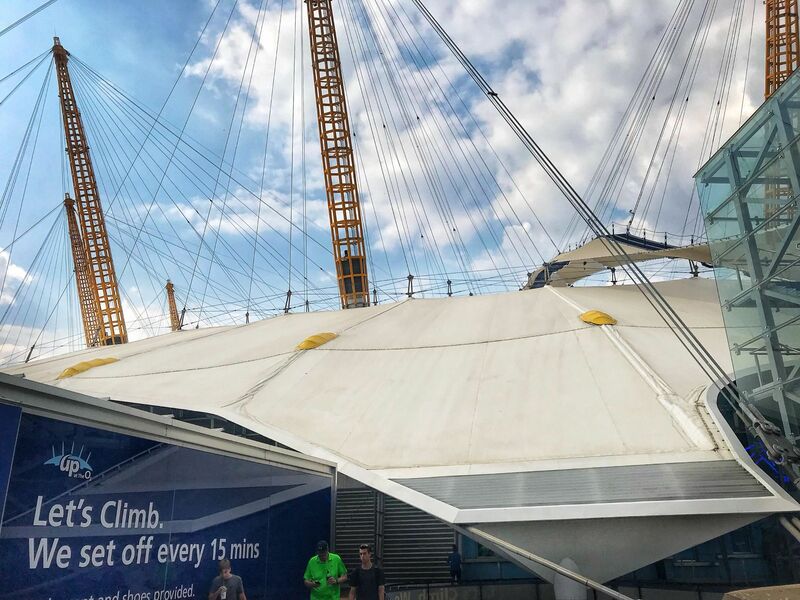 Like perhaps, climb Up at the O2?! 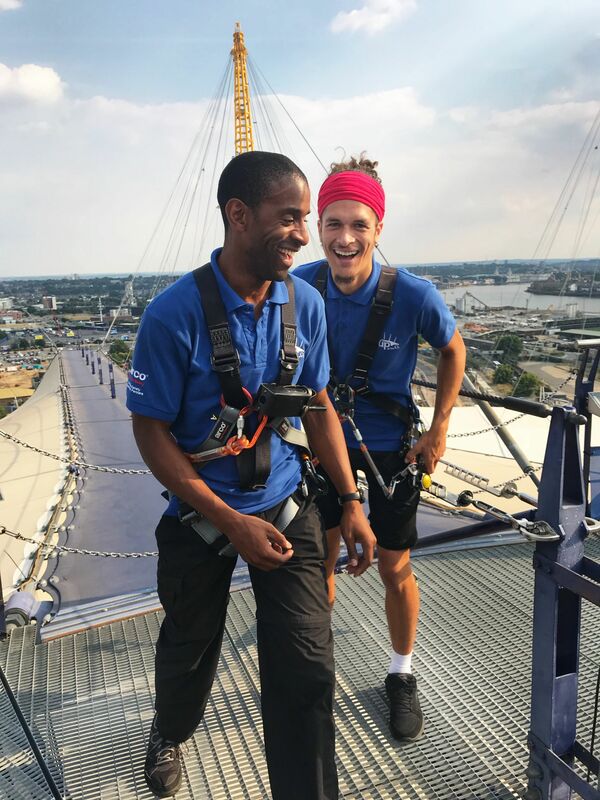 So, when Hotels.com got in touch asking if I wanted to climb the O2 with a friend, I thought why not! Hotels.com have a wide selection of hotels near the O2 in North Greenwich, and this is one of many attractions available to visitors staying in the area. 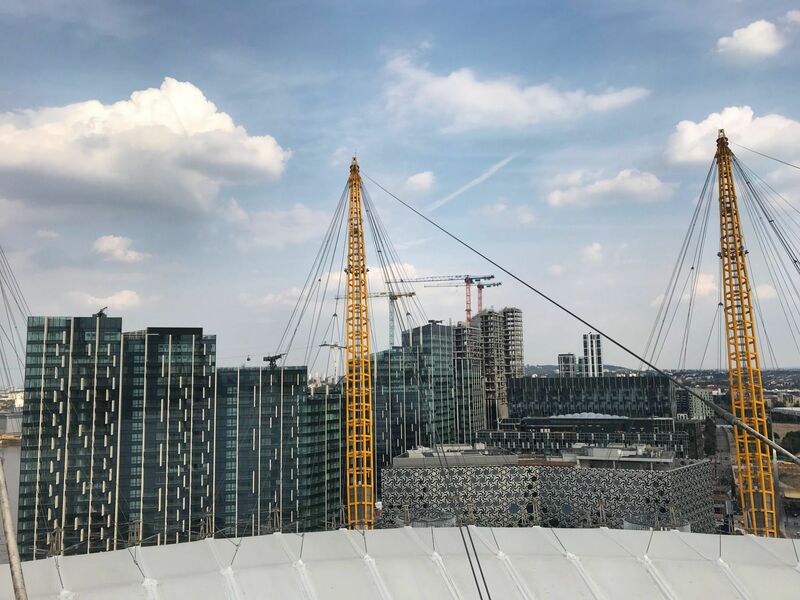 As you walk up to the O2, the Up at the O2 basecamp is easy to spot, located on the left of the building. Upon booking, you select your climb slot and arrive 15 minutes prior for your safety briefing. Don’t do what my friend Yvette and I did and get lost on the DLR tube line, arriving at Greenwich rather than North Greenwich! 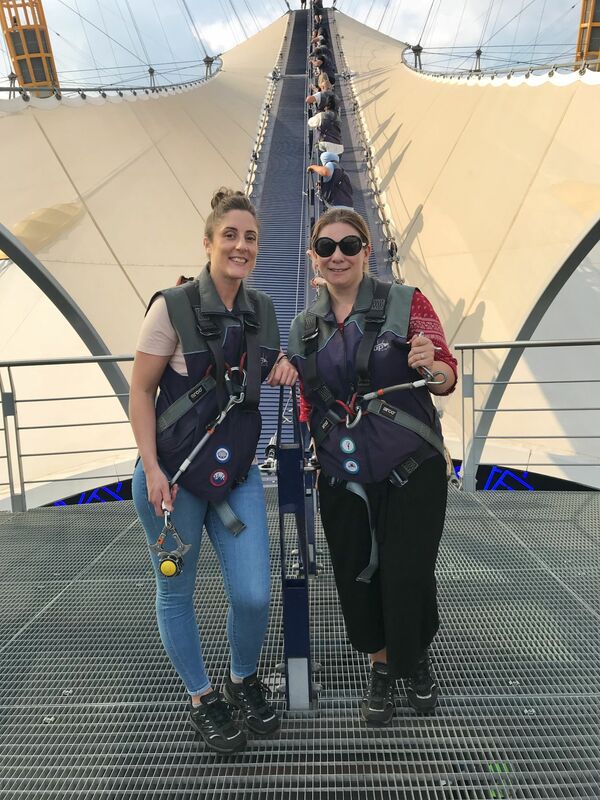 The Arco climbing safety team ensure you are equipped with climbing shoes and a safety harness before locking away any valuables during the climb. Don’t panic, you can take your mobile phone as long as it zipped up in a pocket during the climb! There are plenty of opportunities to take photos once you reach the viewing platform. 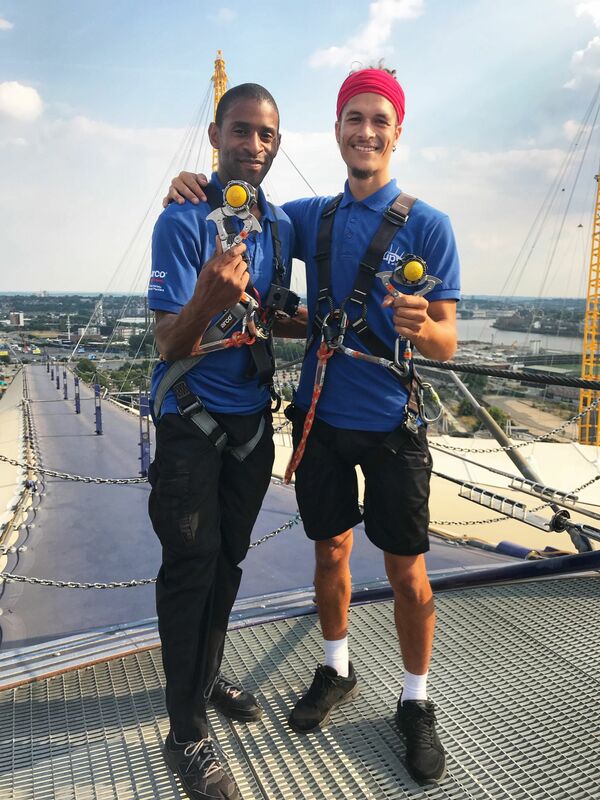 Our climb guides Eke & Shaahid talked our group through the harness and lock, a safety device used to keep you attached to the climbing cable. I am pretty useless when it comes to technicalities, and Eke was happy to show us on a one-to-one basis how to connect the cable and manoeuvre our way on the climb. 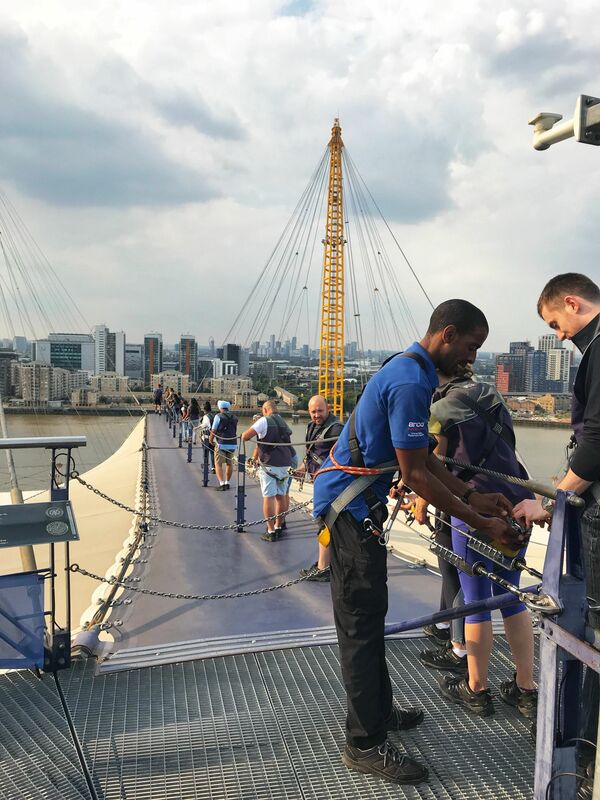 One of the things I liked about the Up at the O2 climb is that the lock is always attached to the cable, which takes away any nervousness trying to re-connect. A factor, which has in the past made me dubious about doing similar climbing activities. The initial ascent, for me, was the hardest part of the 90-minute climb, but luckily it flattens after around twenty metres. That said, it is still fairly easy to complete (if I can do it anyone can!) The rest of the journey, to my delight was not as steep and has only a 30-degree incline at its steepest point. Yvette and I were at the back of our group of climbers and we needn’t have worried about this. If anything, we could take our time and enjoy the scenery over London as we reached new heights. Our climb guide, Eke was always on-hand to reach us if we had a question. 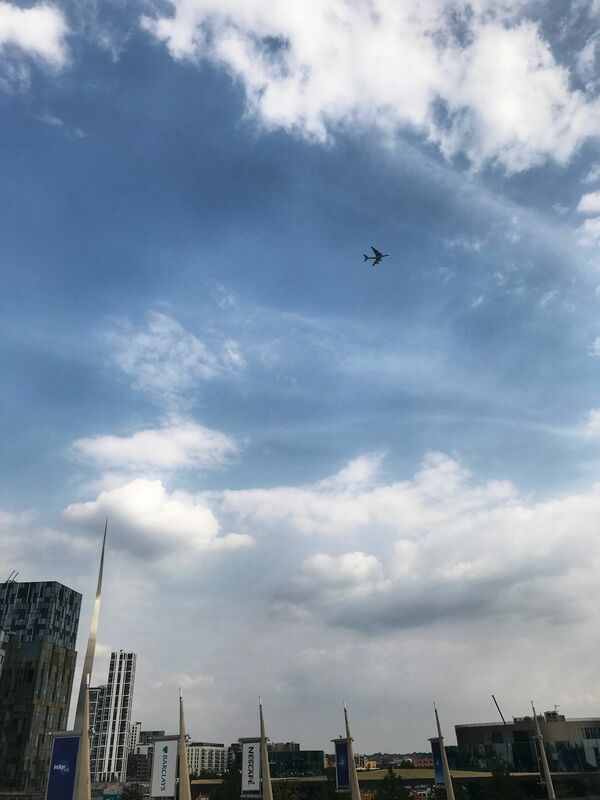 We reached the top of the viewing platform in no time, where we spotted a few key London landmarks including Olympic Park, The ArcelorMittal Orbit, and the iconic Canary Wharf skyscrapers. 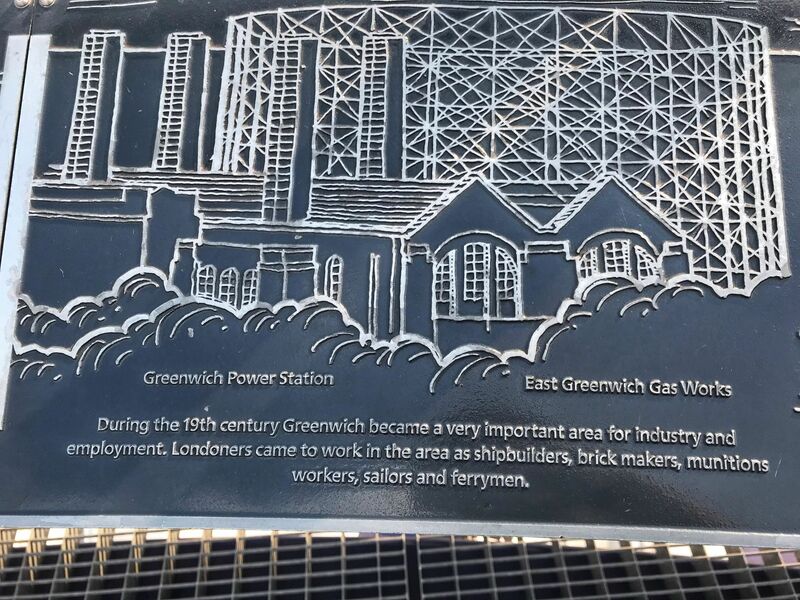 The Royal Observatory Greenwich is also visible and holds importance for both time & the O2. 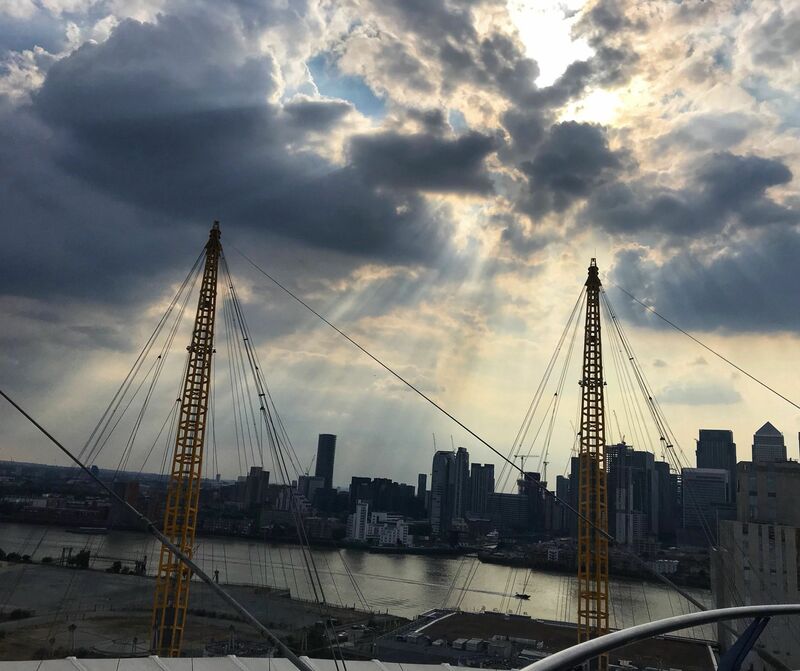 As the home of Greenwich Mean Time (GMT), the Prime Meridian (longitude 0°) of the Royal Observatory passes the western edge of The O2 and this theme of time is woven into the fabric of The O2. 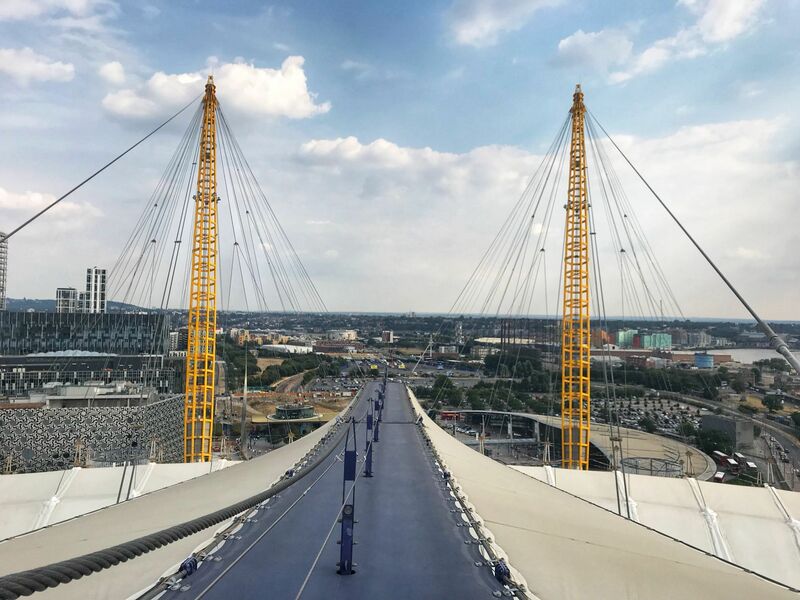 The twelve yellow 100 metre-high masts supporting the O2 each represent a month of the year or each hour of the clock face. 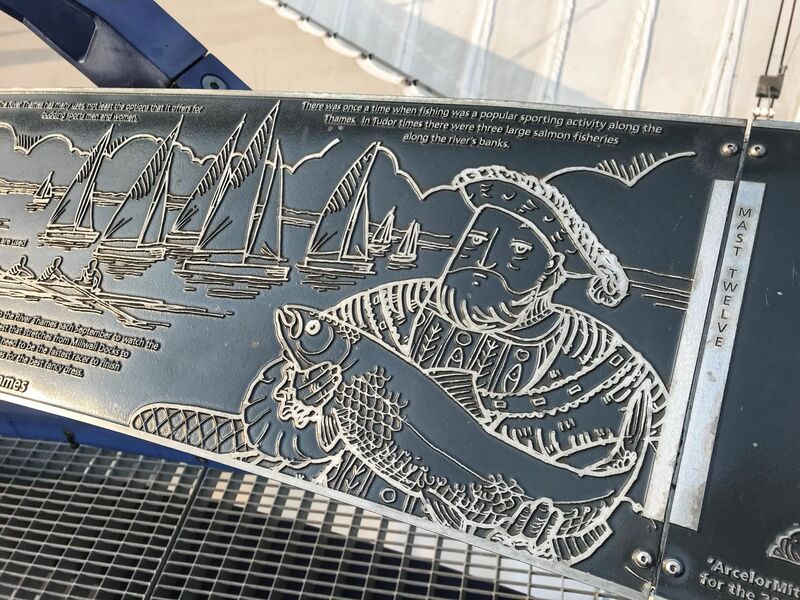 The viewing platform acts not only as a place to soak up the stunning scenery and iconic London landmarks, it also provides history about Greenwich dating back to the Elizabethan and Tudor eras. 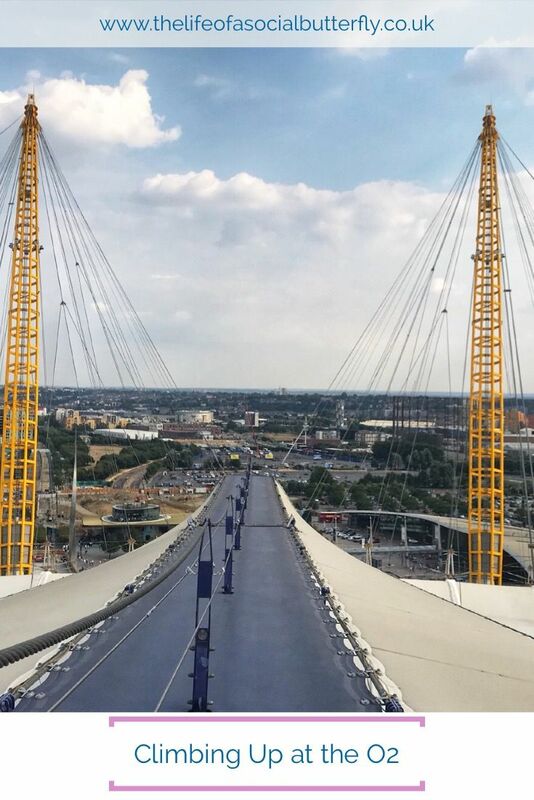 As you stand on the viewing platform, you can see the top of the O2 a couple of metres below. 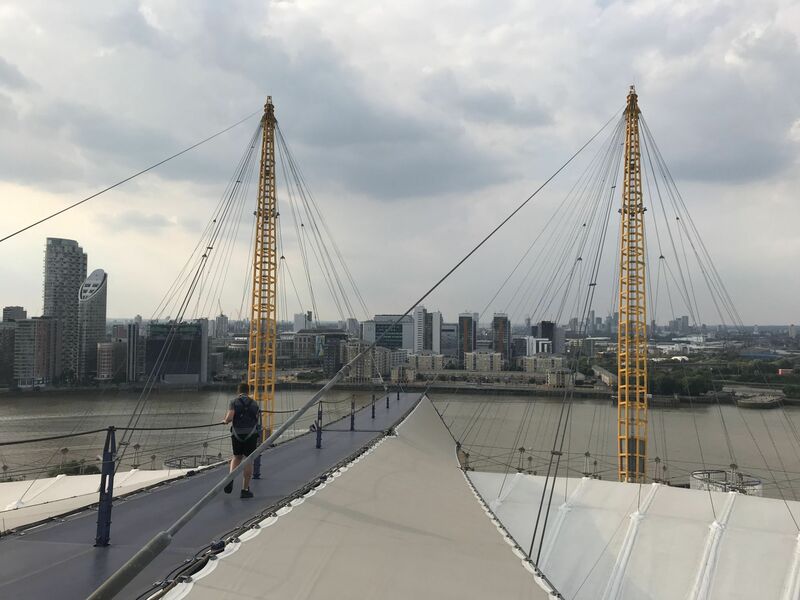 It’s crazy to think that directly below so many world-class performers and stars have graced the O2 stage, and I was getting the opportunity to climb the very building they had performed in. 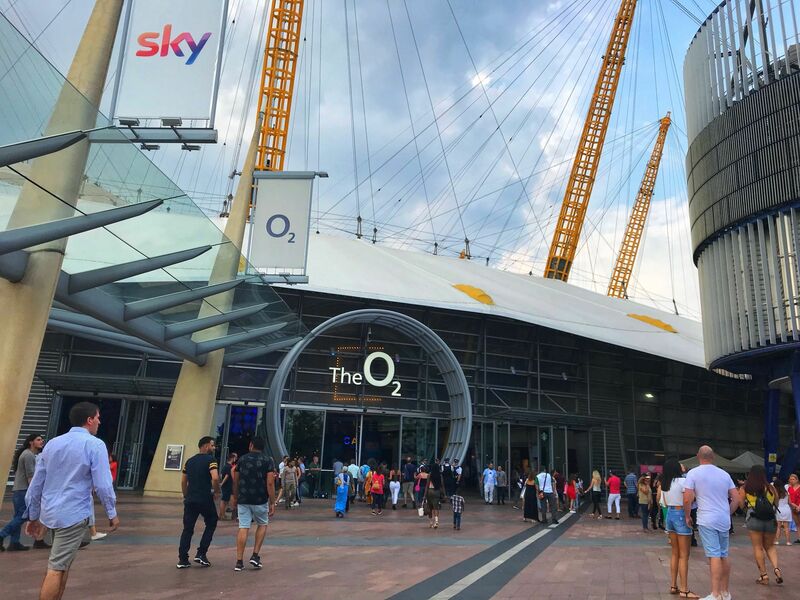 The nostalgia of seeing Usher perform live at the O2 brings back wonderful memories and nothing quite beats the excitement of seeing one your favourite artists perform live. Before I got lost in my own thoughts about being above the stars, it was time for our descent! To climb down, you can choose whether to be forward-facing or climb backward/side on. Climbing backward is understood to be kinder on calves and ankles, though I had no problems going down forward-facing. As I mentioned previously, if I can do it anyone can! There were a variety of ages and groups doing the climb. I had to resist the urge not to act like a child myself, resisting the urge to bounce on the bouncy surface of the climb walkway! We got chatting to a family who had travelled all the way from Canada and, after learning about Stratford in Canada, a place that holds its own festivities in honour of William Shakespeare, I have made a conscious note to go there myself! 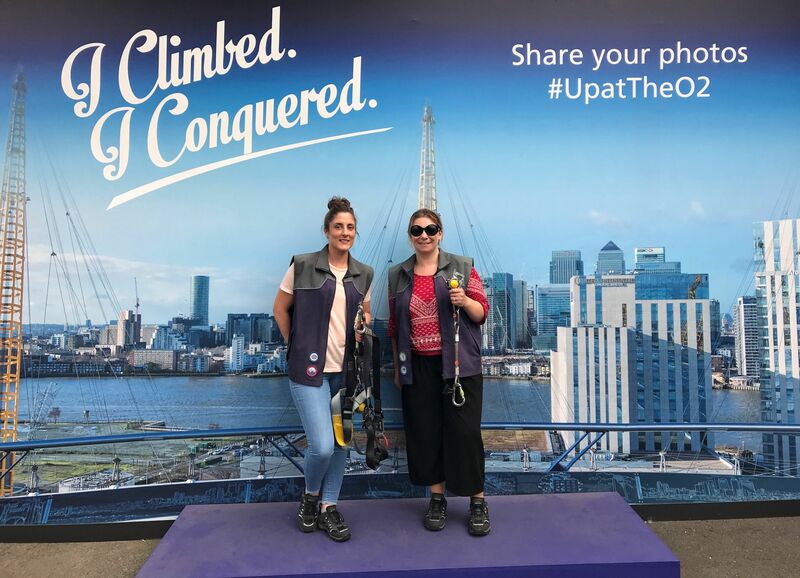 Yvette and I truly loved our experience climbing the O2. For once the weather was glorious, and I’m proud of yet another sporting activity I’ve managed to accomplish! If only we’d had a glass of bubbly at the top of the O2 to celebrate! 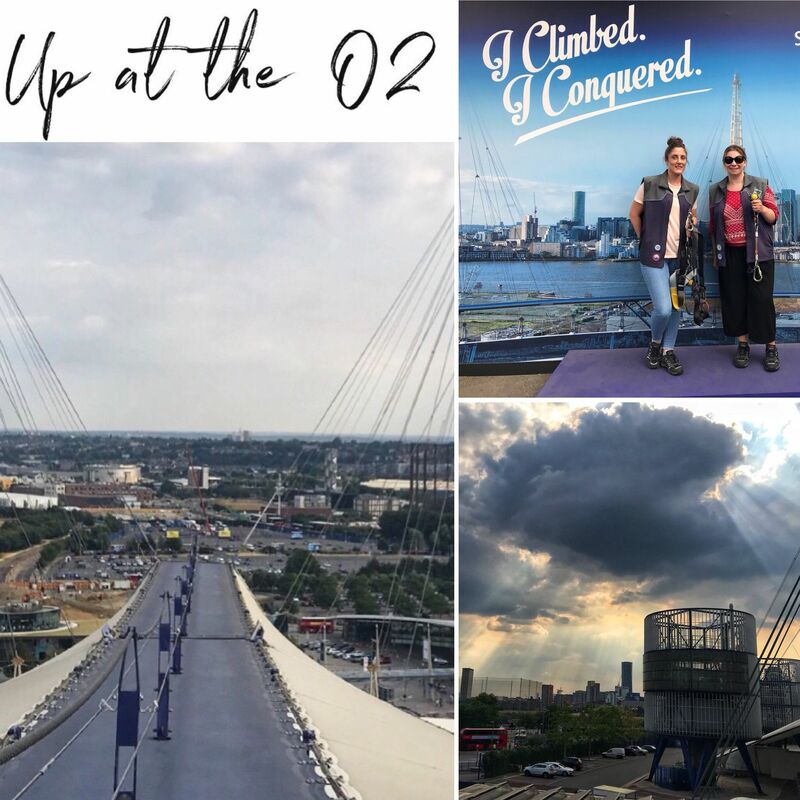 Up at the O2 is a very fun and active way to spend your time if you are staying in London or planning to visit. 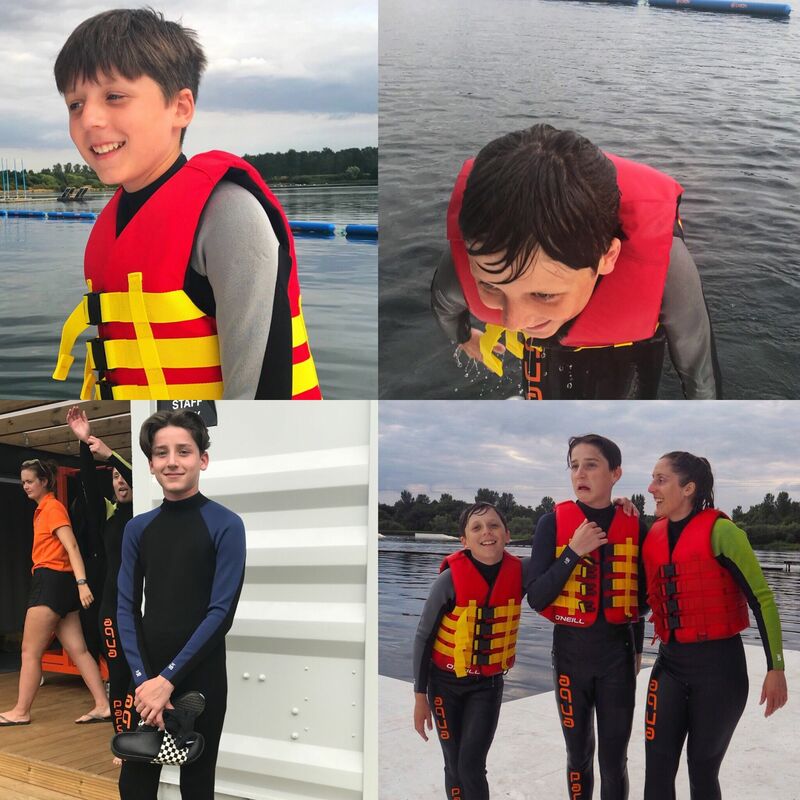 To continue with the theme of fun sporting activities, I had the pleasure of attending the press launch of Aqua Parcs located at Willen Lake in Milton Keynes. 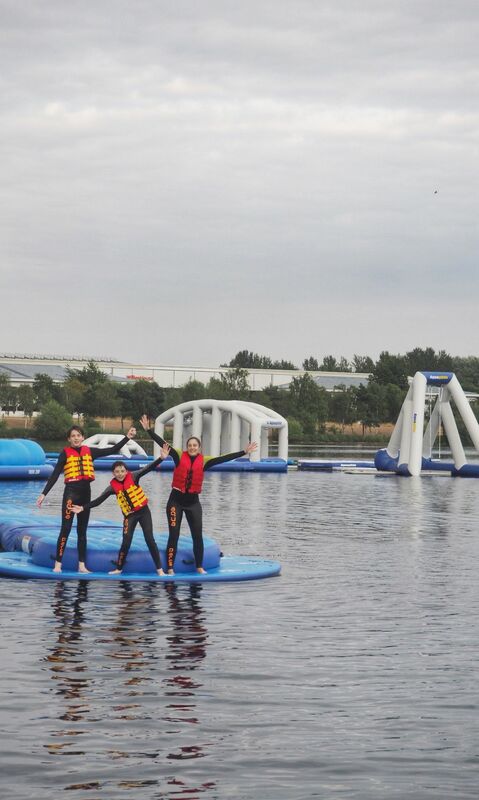 Before I’m accused of being far too sporty than initial observations of this blog would suggest, I must admit I declined from taking part on the Aqua Parcs inflatable assault course. The thought of getting into a wetsuit, whilst still holding onto last season’s spring rolls was enough to put me off. A decision I lived to regret after seeing quite the fun Yvette and her two boys Owen & Jude had splashing, laughing and bouncing on the various obstacles. 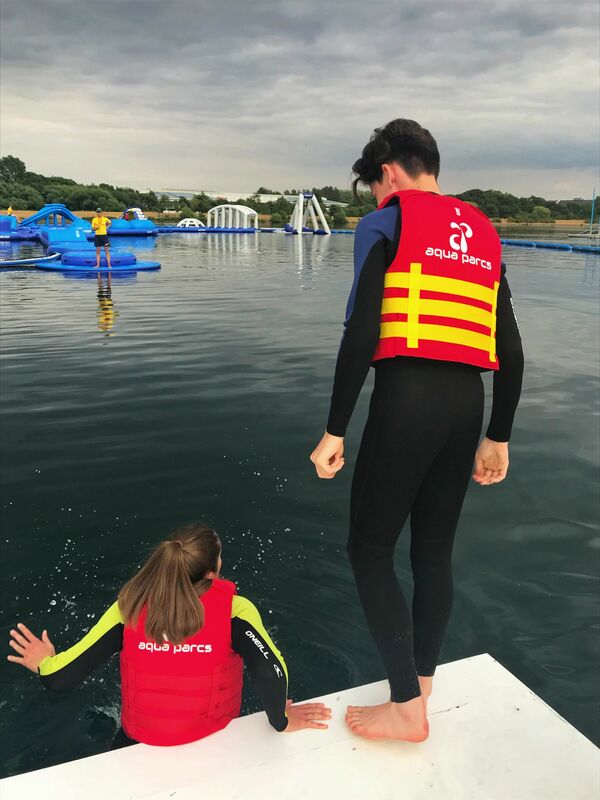 The Aqua Parcs course brings something new and exciting to Milton Keynes (located 5 minutes drive from junction 14 of the M1.) 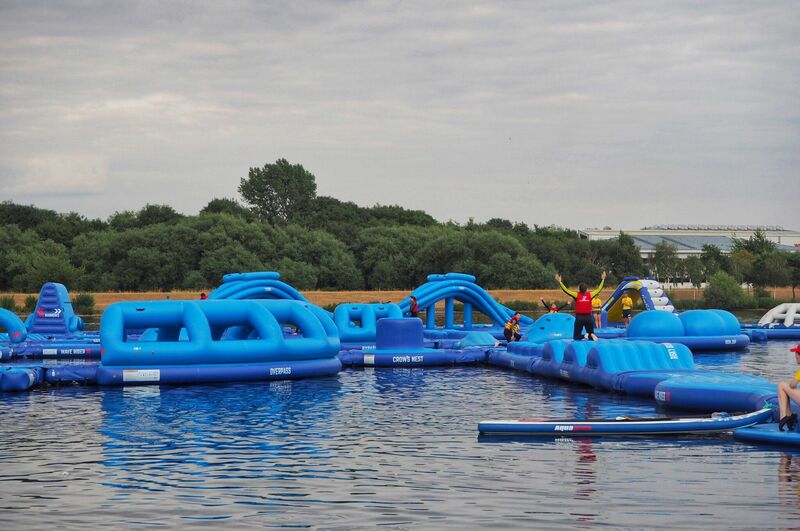 The inflatable obstacle course spans 120 metres over the country park, Willen Lake and has 30 plus obstacles to complete including monkey bars, a swing, and a slide. 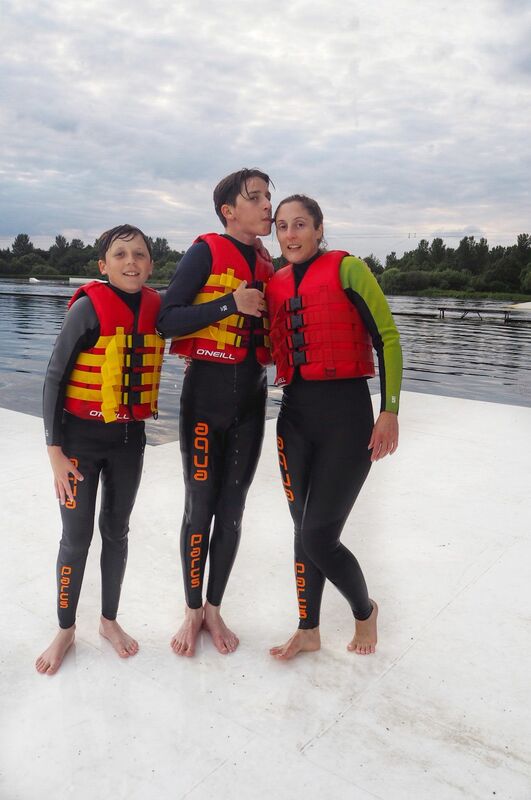 Aqua Parcs is suitable for all ages from ages 8 and above and, I needn’t have worried, all abilities too! 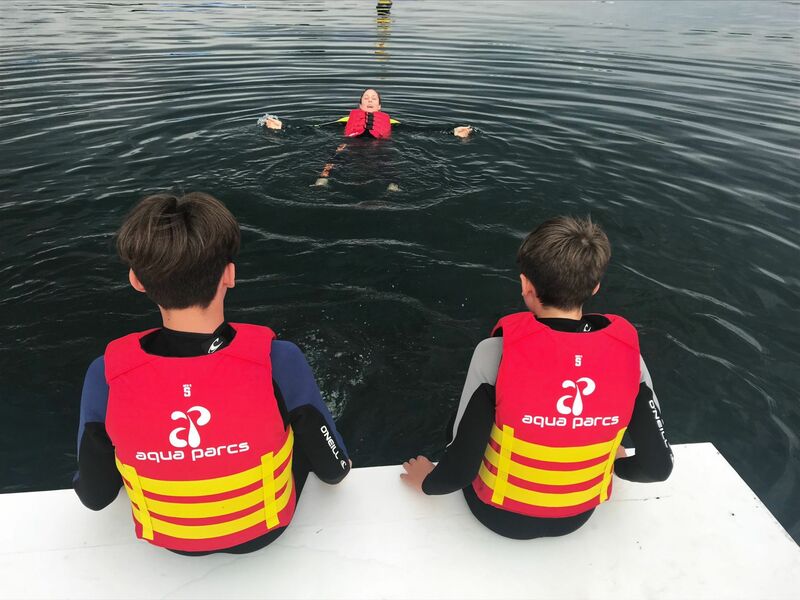 Wetsuits are provided by the Aqua Parcs team so all you have to do is bring along your swim gear and lock away any valuables in the on-site lockers. 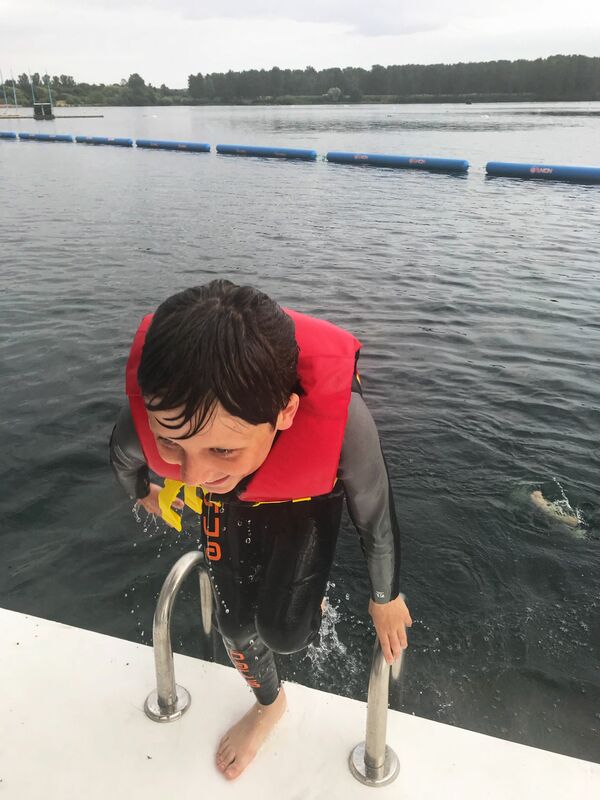 One thing to note, you need to be able to swim 25 metres unaided to take part as getting on the course requires a swim up. It was at this point, Yvette kindly pointed out I would have been unable to take part anyway as I can’t climb out of swimming pools, let alone climb out of the lake onto an obstacle course! Thanks, Yvette! Though, there are lifeguards on site, if, like me, you need a helping hand! If you’re like me and a bit reluctant to get in the lake, you’ll be pleased to know the water on the press day was 0.02% away from drinking water level! Impressive huh! Whilst I was quite a distance from the frivolities of the obstacles, I was able to view from the pontoon and, of course, hear the laughter! Often time spent with Owen & Jude involves movies and computer games, therefore it was great to hear their laughter and see their faces light up as they slid over on the course! Owen, the oldest of the two, is fifteen and it was particularly refreshing seeing him let out his inner child. Even Mum, Yvette had a glint in her eye as she climbed out of the lake! 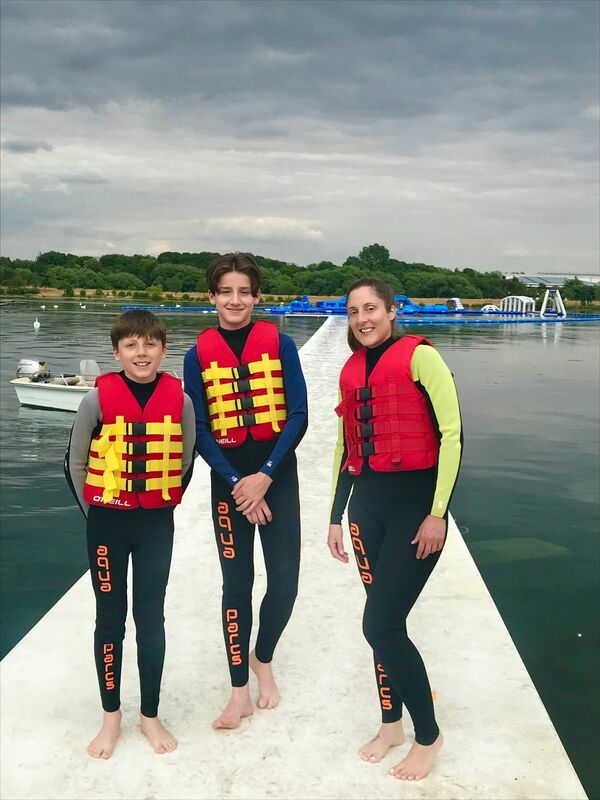 Fun for all the family, the Aqua Parcs obstacle course not only provides a fun activity to keep the kids amused during the school holidays, it’s also a great way to enjoy the great British Summer weather we’ve been enjoying recently! Long may it last! I can also see this activity being popular for hen and stag dos, perhaps stags in particular! 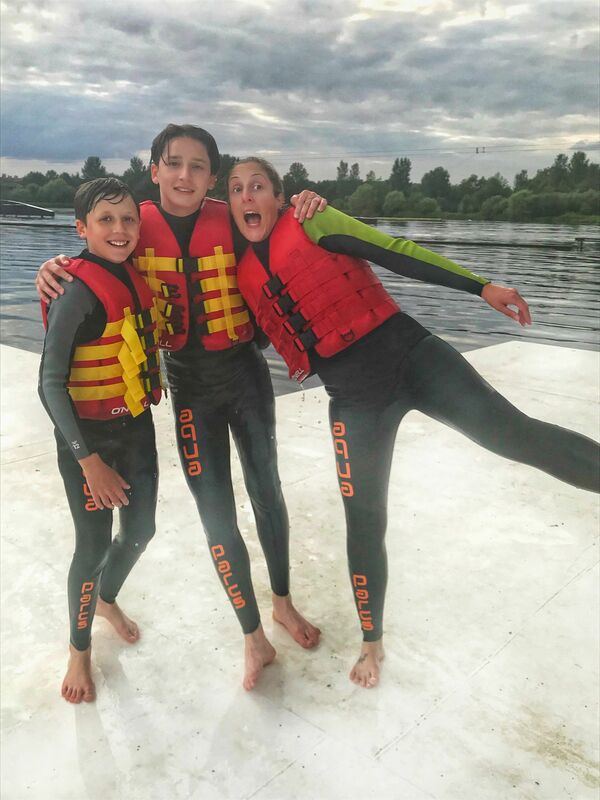 At the moment Groupon are offering 20% off tickets to Aqua Parcs Milton Keynes – Click here to grab your tickets at the discounted rate! 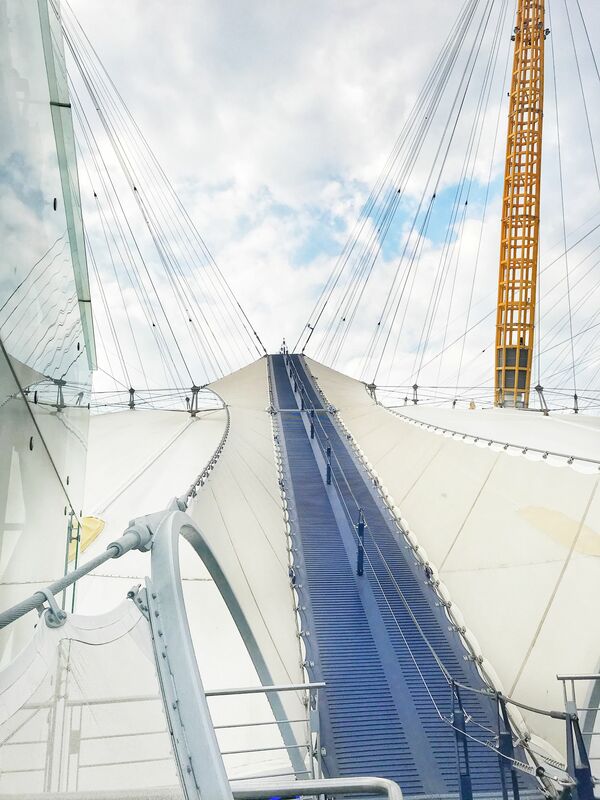 Would you be brave enough to take on the Aqua Parcs obstacle course or climb Up at the O2? Let me know & if you have any questions feel free to ask below. Alternatively, If you can recommend any other fun activities to keep me amused over the summer, let me know! would like to think I am a decent swimmer but not sure if I can climb out to an obstacle course. Climbing the O2 sounds fun though, I would love to do that! What an amazing opportunity – I would do this in a heartbeat! 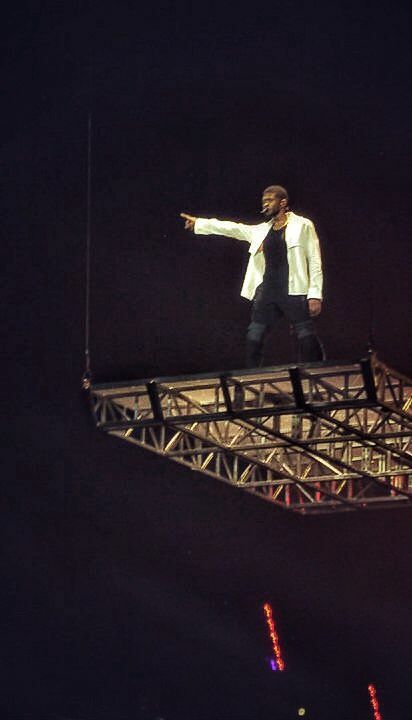 I have a fear of heights, but if it means getting a great view, I will quiet my inner voice and DO IT!! Thanks for taking me along virtually until I get a chance to visit London again and check this out! I am a terrible swimmer but it looks SO fun – I know Chris and my kids would enjoy it! Your photos always get me so inspired, Jaz!! !